Click on the graphic to access the new PDST Online Booking Form. Applications will only be accepted via this online form. Click the APPLY button to filter the Subjects. Book your place from the list of venues & dates displayed. First time users will need to register. See instructions link below for help with registration. 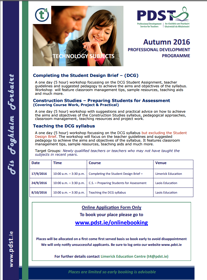 Details of the autumn 2016 series of professional development workshops for the technology subjects are shown below. A one day (5 hour) workshop focusing on the DCG Student Assignment, teacher guidelines and suggested pedagogy to achieve the aims and objectives of the syllabus. Workshop will feature classroom management tips, sample resources, teaching aids and much more. A one day (5 hour) workshop with suggestions and practical advice on how to achieve the aims and objectives of the Construction Studies syllabus, pedagogical approaches, classroom management, teaching resources and project work. A one day (5 hour) workshop focusing on the DCG syllabus but excluding the Student Design Brief. The workshop will focus on the teacher guidelines and suggested pedagogy to achieve the aims and objectives of the syllabus. It features classroom management tips, sample resources, teaching aids and much more.